Every now and then when I sign an autograph somebody always ask "What is going on with your autograph?" Well there is a lot to know about my autograph that may be of interest to autographers. I guess the autograph I have today is the aftermath of sitting through many boring college classes. Whenever I got bored in class I would screw around with signing my name differently. One day my sophomore year I went to get the Seton Hall basketball team to sign a couple basketballs at their hotel. I can't remember the player's name but his autograph had his name with a basketball in it. I thought it was a cool idea and started toying with baseball stiches inside of the P in Pat. That summer I went out to the Cape Cod league and signed a bunch of autographs and the signature was well liked. From that point on I have signed this way. I was going to have a section for my new 2006 Topps Update card but I was a little late to the sold item section. 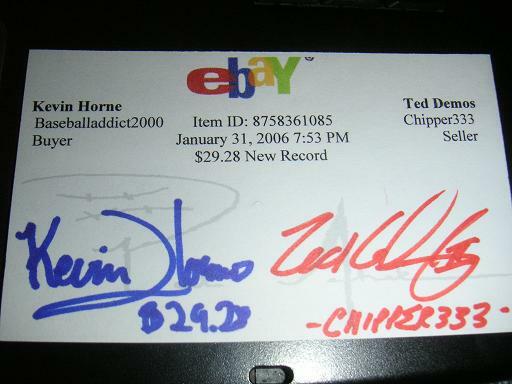 I think I saw a couple of them go for $50 and once again it was Baseballaddict2000 who paid the most money. The highest paid for a refractor was $83. You have a new record/category you want to submit, write me an email or post a comment under the discussion board.